My babies are finally here!! 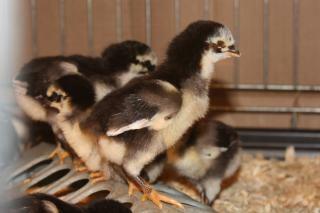 I have 12 new Sumatra babies from Cackle Hatchery. I will post pictures of them on here as the grow up so that people can see what Sumatras look like as they grow up because there are not many pictures of "teenage" Sumatras that can be found easily. Mine are from a hatchery so if they don't look like perfect Sumatras that is probably why. This is a group shot of some of the babies, the rest were all exploring their new home while these where enjoying their light. 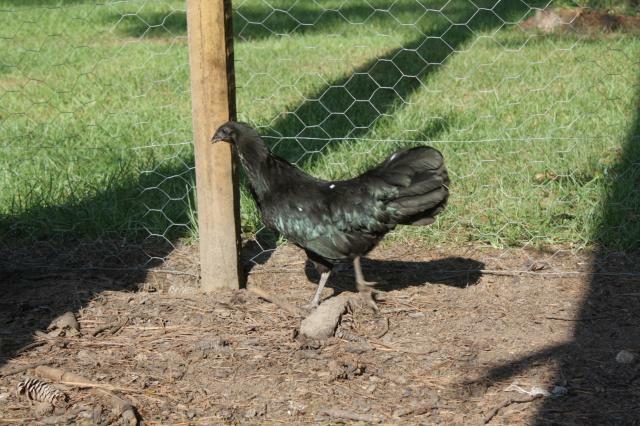 This is one of my babies itching those new feathers comeing in. 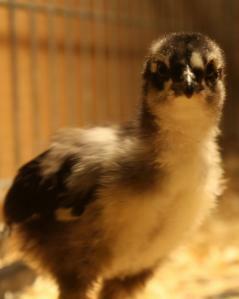 This is my meanest little chicken. Instead of waiting his turn for a drink he will grab someone elses leg and drag them out of the way so he can get something to drink, and if someone is sleeping were he wants to sleep well he just walks all over them until they move. He is the biggest out of all of them and he therefore thinks it is his right to pick on everyone else except my tiny baby, he sticks up for the littlest one when someone is picking on them. 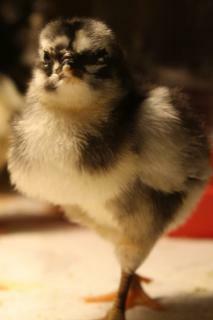 This is my little bouncy chicken. He waits for all the others to lay down in a semi-circle and then he just hops on one and runs over all of the rest until he runs out of chicks. It is hilarous to watch. If some one is in his way he will jump over them instead of going around them. 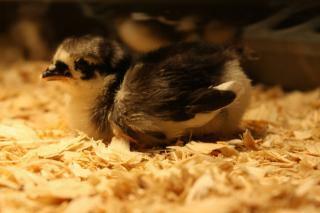 This one is my backwards chick. It walks backwards more than it walks foreward and I can't figure out why. This is my cute picture of the week. 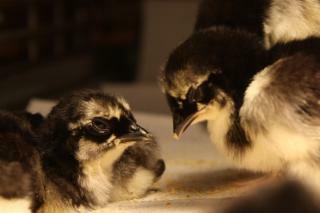 Two of the little chicks were falling asleep beak to beak. This is tiny, he is the smallest out of all the chickens and of course his best friend is going to be the biggest chicken of the group. He is the loudest chick too. This is my escape artist/ curious chicken. He has escaped once already by speezing between the bars of the dog cage they are living in and the bottom tray, I have moved the tray back now so he can't do it again. The second attempt wasn't as successful as he got his head out and one foot and got stuck but instead of crying he figured out a way to fix the problem himself. He took his toe in his mouth and pushed backwards with his other leg and with a little push by me from the front he fell backwards and was free. He hasn't tried to escape anymore, yet. 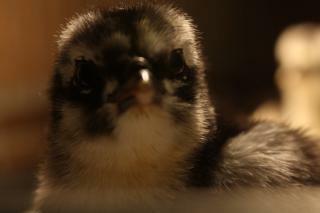 He is also the only chick who pecked my camera when I was trying to take a picture. All twelve babies are doing great and they are getting funnier to watch by the day. 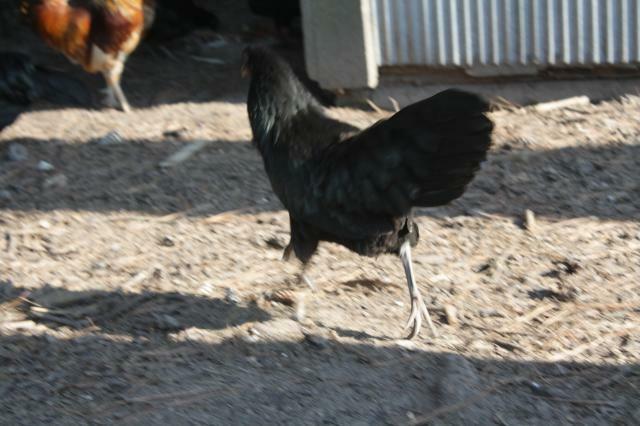 The have started to get in wing feathers and are "flying" around except their feet never leave the ground. Now that all the emergencies of the past week are past I am really starting to enjoy these chicks and not worrying about every little thing. These three are the mean ones. 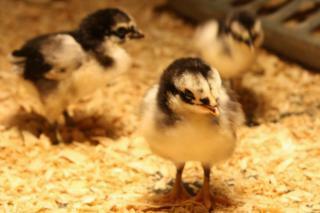 They are my attack chickens, they attack anything that comes into their brooder. They attack my hand, their water, their food, and even my camera. 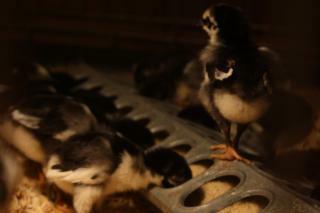 They just charge and start pecking until the thing they are attacking moves and then they run for cover at the back of the brooder. 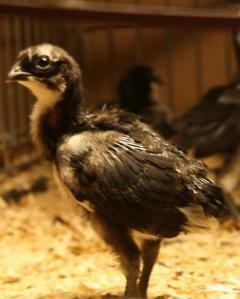 This is my gaurdian chick. He will walk back and forth across the feeder and watch everyone else eat. Every once in a while he will stick his head down and get a bite but he never leaves his perch while every one else is eating. 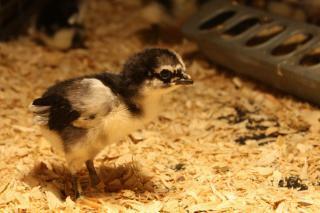 This is my little chick who wouldn't walk for two days. 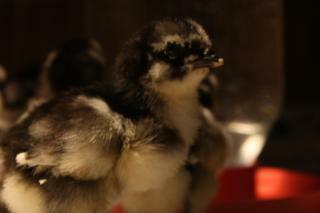 It turns out the chick couldn't walk because one of the other chicks hurt her leg. I am happy to say that she is up and has learned to limp and even her limp is starting to go away now. She is the sweetest chick out of the bunch. I can pick her up and she just falls asleep in my hand and refuses to get out of my hand when it is time for her to go back into the brooder. 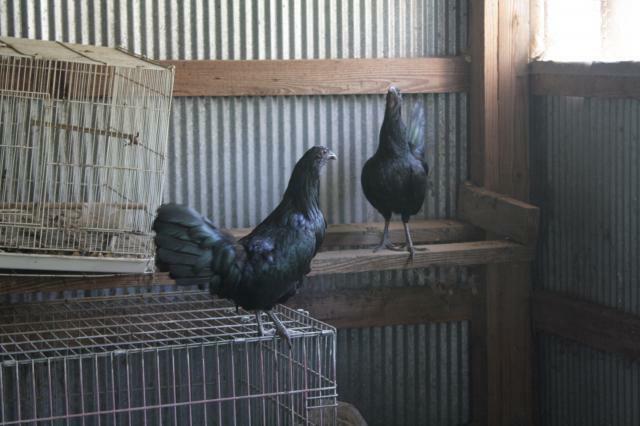 These are my only chickens who roost so far. 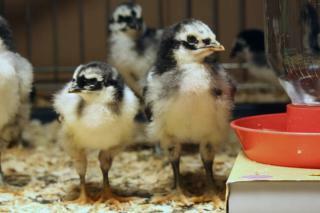 I haven't figured out how to fix a roost in their brooder so they roost on their feeder. 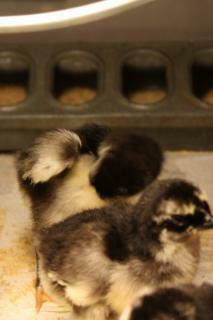 These are also the three attack chickens. This is my cute picture of the week. 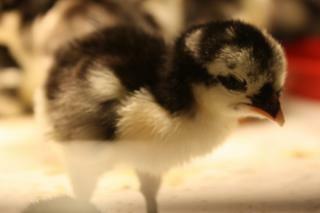 It is one of my little chicks sleeping all by itself. I am sadly down to 11 chicks now. 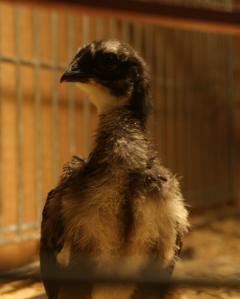 I had to cull my limpy chick because Sid Vicious pulled her other leg and she couldn't support her own weight. In good news though they got their first treats on Monday. I cut up a strawberry into about forty little pieces and one chick would pick up a piece and the other ten would start chasing the one with the treat and completly forget about the other peices of strawberry. It was so funny to watch because they would fly around and fight and when the one with the treat stoppe paying attention one of the others would grab the strawberry. They played with one piece for almost five minutes. This is my littlest chick and my biggest chick. Their names are Tiny and Sid Vicious. Believe it or not but Tiny is actually my meanest chick. I named the other one Sid Vicious because he used to pick on other chicks and pull their legs out from under them and he kind of reminds me of Sid Vicious in the way he looks and acts. He tried to do it to Tiny but Tiny attacked him and now they are inseperable. This is my little Vulture. It is the nicest chick I have. Anytime I open the door he/she comes running and jumps on my hand and won't get back down until I make her. I was carrying her around one day and a neighbor stopped by and when he saw her he said "Aww, how cute you have a baby vulture" and the name kind of stuck. This is Spot. He/she is my curious chick. He/she is the only one who has successfully escaped unnoticed. 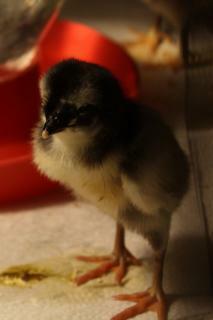 Once he/she was finished exploring he came right back and asked to be put back in the brooder. That is also the only time I have heard Spot make a noise. 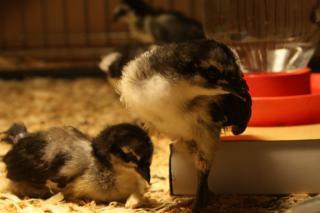 This is one of the unnamed chicks streaching and kicking another sleeping chick in the head while doing so. I thought it was cute. This is the "King of the Waterer". 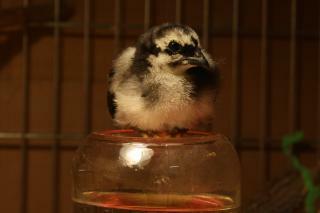 I have two different roost in the brooder at two different heights and this chick still sleeps on top of the waterer. It will not let anyone else on it's waterer and if they try this chick will fight them off no matter how much bigger they are. This chick never backs down from a fight. One Year Old and all Grown up. 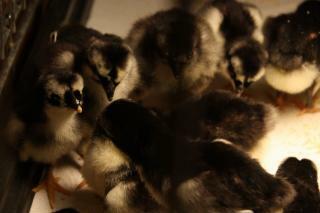 Out of 25 straight run chicks I ended up with 11 that lived past 3 months old, 10 hens and one rooster. 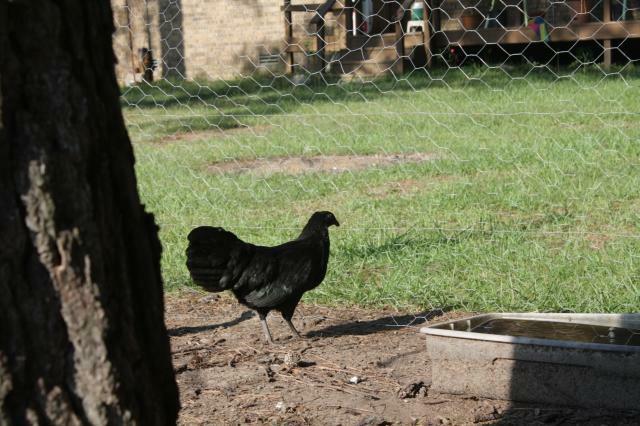 Then my rooster died while protecting his hens. I am still looking for a new roo. 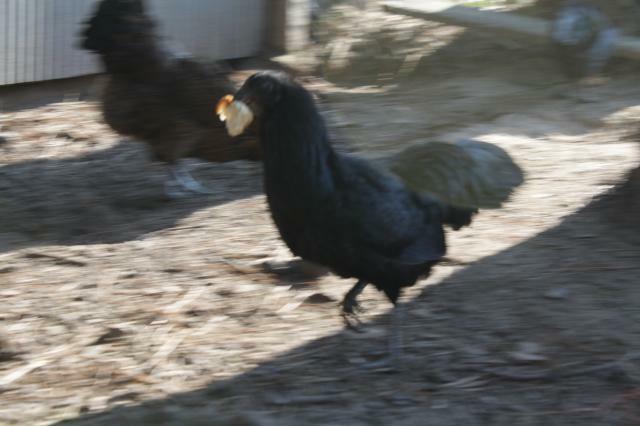 This is one of my hens with "her" bread. When I give them scraps they all grab a piece and hide and eat it away from the others. This one is running back to get some more scraps. This is two of my girls racing for the best spot in the rafters. These chickens can fly. We had to put a top on the chicken pen. My girl Vulture wearing mashed potatoes. This girl so want some grass but it is just too far away. There is a one foot bare space all the way around my chicken pen where they ate the grass. They also like eating horse flies, thats why my horses like to stand next to their pen.